Hello, let me introduce myself and my business Prairie Workshops. My name is Chuck Andrews and I’m starting this website to share my projects with you. I have a wide variety of interests and I hope that you enjoy my projects. I’m a retired chemist. I worked in the pharmaceutical industry for 30 years and for the last several years I have worked as a consultant helping personal care companies formulate and manufacture products like shampoos, body washes and mouthwashes. I have always loved my work. However, I have lots of other interests also. It’s these special interests that I want to share with you in this website. I have been a lifelong tinkerer and woodworker. For the last twenty years I have volunteered with an organization called Tillers International (http://www.tillersinternational.org) . I love the mission and people at Tillers. I hope I can share some of my enthusiasm with you. For many years I have taught traditional craft classes at Tillers. These include coopering, making wooden pitch forks and hay rakes, wheelwrighting and blacksmithing. During high school I always wanted to be a machinist, why I ended up with the career I did has always been a mystery to me. It’s no wonder that somewhere along the line I also started doing machine work. There are lots of ways to learn new crafts; study it, do it, share it, talk about it, teach it. I do all of these things. Several years ago I needed a new shop. My shops had always been in the basement and garages of the houses that I lived in. 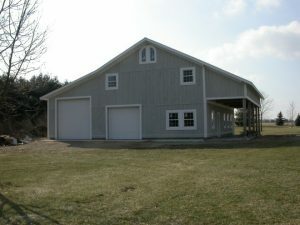 So with a lot (huge amount) of encouragement from my wife we built a timber frame barn (shop). It did not just happen that I chose a timber frame design. At Tillers International we started a timber framing program and taught this skill. Over the years I worked on a dozen or so buildings and grew to love the processes, materials and most importantly the resulting space that it created. This is where I work now and I have never regretted the huge amount of effort that it took to build the shop. The shop’s foot print is 48’x48” and has a second story that measure about 30’x48’. And, yes, it is full of junk. 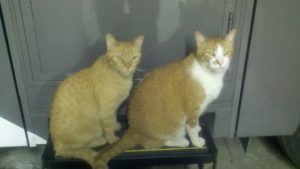 I have two cats that live in my shop, Tiger on the left and Creamcicle on the right. Tiger is the president of the company and Creamcicle is the CEO. They are not the worst bosses that I have worked for. I love doing demonstrations of my crafts. 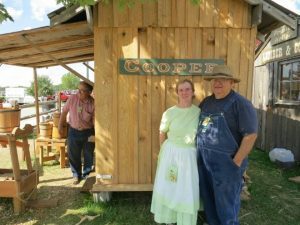 I set up blacksmithing or coopering demonstrations at several fairs and living history museums around the area. I seldom sell anything. I usually give away more than I sell and I usually talk more than I work. I enjoy showing people the processes, materials and products that have played such an important but obscure part of our history. And, as I have always found, I get way more from the weekend than I give, it never fails. That’s why I always encourage students to share, demonstrate and teach what they have learned. How Many Lathes Do You Need? If you would like to see what I’m offering in my online shop for purchase, click here.